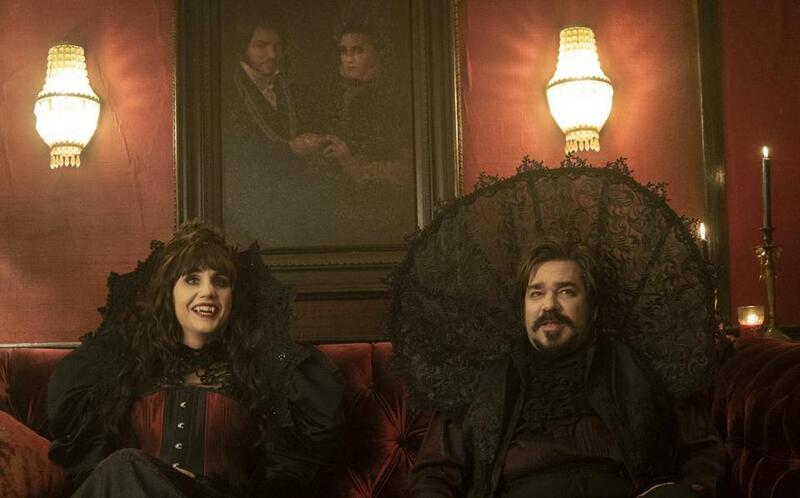 Natasia Demetriou and Matt Berry play vampires on Staten Island. The tortured, intellectual, world-weary vampire has been a common trope for many years now, from Barnabas Collins of the soap opera “Dark Shadows” to Anne Rice’s fiction to the “Twilight” novels and movies. Ah, to live forever, to reawaken to the world after death, to have an infinite amount of time to do whatever you want, and yet be fully, broodingly, and bloody miserable. “What We Do in the Shadows,” a new FX series based on the 2014 movie, is having none of that gothic business. The show is a smart, irreverent spoof, shot as a mockumentary, that mines the daily — or should I say nightly — lives of three lovably moronic undead housemates in a cobwebbed Staten Island manse. The influences on the show, which premieres Wednesday at 10 p.m., run from the inspired kookiness of “Young Frankenstein” to the downbeat rhythms of “The Office,” but “What We Do in the Shadows” is entirely its own organism, as it broadly deconstructs the genre. As over-the-top as it all is, the characters become more endearing as time goes on, a sort of twisted family unit that has been together for hundreds of year. Laszlo (Matt Berry), Nandor the Relentless (Kayvan Novak), and Nadja (Natasia Demetriou) think of themselves as grand world figures, and they dress accordingly in old robes, but the truth is less than glamorous, and the show’s many Staten Island jokes emphasize that. In the premiere, an ancient vampire leader orders them to take over North America, which ultimately brings them to city council meetings to announce that they’ll be starting with a local coup. The three actors, new to me, are all terrific as they wield their heavy old world accents and hiss at one another in frustration, most of all Demetriou, whose constant impatience and patriarchal anger is interrupted by her sexual obsession with a human man (played by Jake McDorman). Nandor’s “familiar” — the servant who guards his casket and gets rid of his empty corpses — is also an essential character in the ensemble. Guillermo (Harvey Guillén) has loyally followed Nandor’s orders for 10 years now, hoping his self-absorbed master will ultimately decide to make him into a vampire. He desperately wants to be turned, but Nandor clearly has no plans to do so, especially since Guillermo is so skilled at his work. When the vampires tell him to bring home virgins for a celebration, so they can feast on virgin blood, he goes — where else? — to an event for supernatural-minded LARPers (live action role players), who are famously geeky. He brings home a pair of kids who marvel at the realness of all the new players they meet. As the show punctures the romance of the vampire genre, it also addresses its popularity. Brought to TV by Jemaine Clement and Taika Waititi (both from the film), “What We Do in the Shadows” is great looking, from the dusty, draped interiors of the manse to the flavorless, beige city council meetings. It also unfolds ably, mixing its endless one-off gags with ongoing story line arcs. In the years after the original “The Office,” the mockumentary style of sitcom, with its direct-to-camera interludes, has become overused on TV. But it works well in “What We Do in the Shadows,” even if it doesn’t forge new ground, most likely since it’s being used to introduce such an exotic world. It’s hard to say if, at the end of the season’s 10 episodes, the show will continue to amuse, but “What We Do in the Shadows” is off to a great start, if you like batty humor. I suggest you invite it in for a visit. Starring: Kayvan Novak, Matt Berry, Natasia Demetriou, Harvey Guillén, Mark Proksch, Beanie Feldstein. On: FX, Wednesday at 10 p.m.